In an effort to create an environmentally friendly source of energy, researchers have now engineered bionic mushrooms that are capable of producing electricity. The mushroomsare equipped with energy-producing bacteria and an electrode network. This incredible breakthrough was achieved by researchers at the Stevens Institute of Technology. The team, which was led by Manu Mannoor and Sudeep Joshi, set out to cultivate an artificial symbiosis between button mushrooms and cyanobacteria. In nature, there are many organisms that live closely together and interact with each other in a symbiotic relationship that is often mutually beneficial. For the investigation, the experts created a scenario in which a mushroom would provide shelter, moisture, and nutrients to bacteria that were 3D-printed onto the mushroom’s cap. These bacteria would, in turn, supply energy through photosynthesis. Alongside the bacteria, graphene nanoribbons would be printed to capture electrons released by microbes during photosynthesis, triggering the production of bio-electricity. 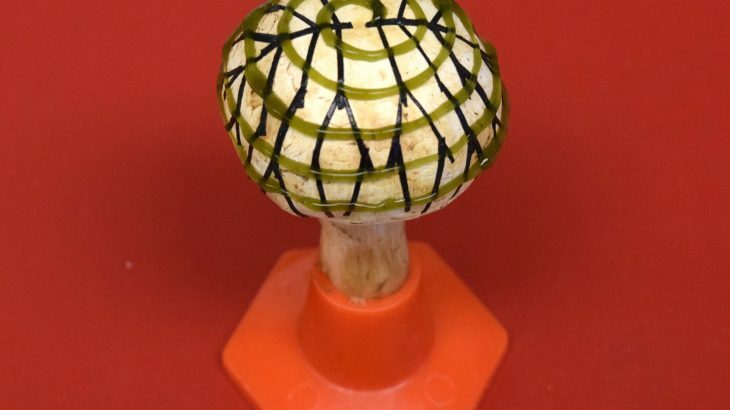 To make the bionic mushroom a reality, the researchers used an electronic ink containing graphene nanoribbons and 3D-printed it onto the cap of a living mushroom. Next, a bio-ink containing cyanobacteria was printed onto the cap in a spiral pattern which intersected with the electronic ink at multiple sites. At these intersections, electrons could be transferred through the outer membranes of the bacteria to the conductive network of graphene nanoribbons. When the researchers used light to activate cyanobacterial photosynthesis, a current of about 65 nanoAmps was generated. While this current is not even strong enough to power an electronic device, the experts said that an array of bionic mushrooms could generate enough current to light up an LED. The researchers are currently exploring ways to generate higher currents using this system. They explained that this 3D-printing approach could be used to organize other bacterial species in complex arrangements to execute many useful functions, including bioluminescence. The study is published in the ACS journal Nano Letters.